/EIN News/ -- Vancouver, British Columbia, April 16, 2019 (GLOBE NEWSWIRE) -- Fairmont Pacific Rim, the iconic Vancouver hotel that has developed into one of the city’s premier live music venues is launching a song search contest that invites singer/songwriters to submit an original song for the ‘Soundtrack to the Pacific Rim Life’. The soundtrack is being created to celebrate the hotel’s ongoing commitment to live music which has been underscored by the unveiling of a new, dedicated state-of-the-art performance stage at The Lobby Lounge. The song search is open from April 16-May 16 to solo performing music artists across Canada (excluding Quebec). The contest prize, valued at $50,000 CAD, includes round-trip airfare to Vancouver, a 10-night residency at Fairmont Pacific Rim to enjoy an exclusive ‘suite life’ experience in a Fairmont Gold Owners’ Suite, 10 hours of recording studio time in Vancouver, west coast excursions, a vlog series captured by Noravera Visuals, headline the soundtrack launch at The Lobby Lounge, and a $5,000 cash prize. The winner will be announced on Tuesday, May 28 and chosen by a panel of celebrated Canadian music industry leaders including including Dave Genn, recording artist and producer of Canada’s 54-40, Jeffrey Latimer, CEO of Canada’s Walk of Fame and President of JL Entertainment, Jodie Ferneyhough, President at CCS Management, Darcy Gregoire of The United Talent Agency and Kelly Daines, Owner and Creative Director of Siegel Entertainment. Singer/songwriters are invited to submit their original song submission along with a portfolio of their music, and a 30-second video interview, through the official contest page. 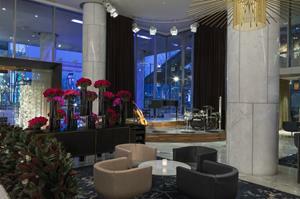 The soundtrack submission must illustrate the lifestyle experience of the Fairmont Pacific Rim. Fairmont Pacific Rim also invites music lovers to enter for their chance to win an exclusive Green Room experience by taking the “What’s the Soundtrack to your Life” quiz. 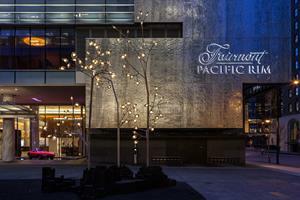 Fairmont Pacific Rim - Vancouver's definitive luxury hotel - was rated the World's Best Business Hotel by Condé Nast Traveler readers and awarded the coveted Forbes Travel Guide Five-Star and AAA Five Diamond Ratings. This ultramodern downtown hotel offers unobstructed mountain and harbour views, combining the best of the Pacific Rim in its architecture and décor. The hotel features three eclectic dining destinations, resort-style Willow Stream Spa, rooftop pool deck, lavish guestrooms, and a variety of the city's most luxurious suites including the new Owner's Suites; a collection of stylish mid-century modern designed suites, inspired by what makes a city feel alive.